A mystery that has bedeviled me for several years was finally solved this past Monday thanks to participants in the Southwest Ohio BYGLive! Diagnostic Walk-About and my Walk-About partner, Julie Crook. As I reported in my July 1, 2016, BYGL Alert! (Coneflower Calamities: Round 1), Sunflower Head-Clipping Weevil (Haplorhynchites aeneus) females clip the flowers of coneflowers as well as members of the Silphium genus. Indeed, the weevil is sometimes called the "Silphium weevil" owing to its strong association with plants in this genus. At the Walk-About location, I have in the past observed clipped flower heads on compass plants (Silphium laciniatum) and cup plants (S. perfoliatum). The damage looks very similar to that produced on coneflowers including deflowered stems, fully opened flower heads dangling from partially clipped steams, and flower heads on the ground. However, despite repeat visits and close monitoring last season, I failed to find any damage to the flowers of prairie dock (S. terebinthinaceum). As I was holding forth on the baffling lack of damage to prairie dock, Julie pointed to some dangling flower buds. Then the entire Walk-About group began wadding through the mass planting to find more dangling, darkened, unopened flower buds as well as weevils cavorting within the bud structures. It was an epiphany. 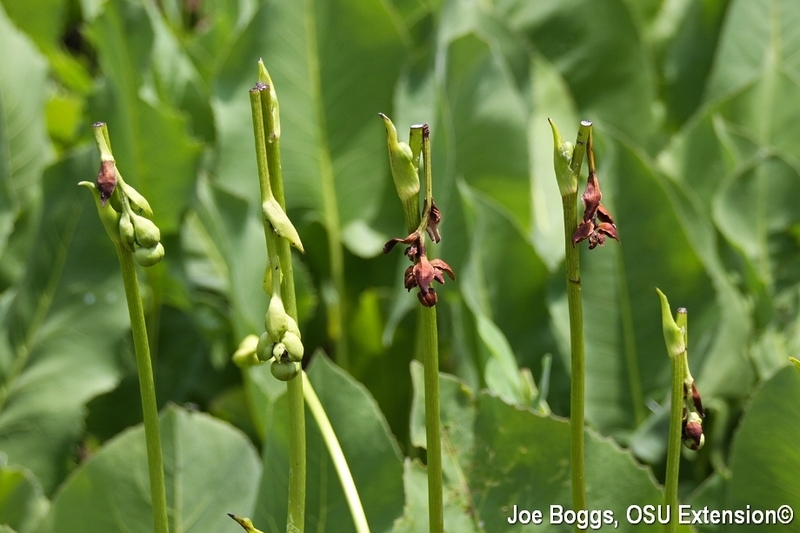 Unlike their behavior on coneflowers, compass plants, and cup flowers as well as other members of the aster family (Asteraceae = Compositae), the weevils attack prairie dock before the flower buds open! I had simply missed the damage in the past. Of course, my marginal credibility was further eroded with many Walk-About participants threatening to revolt if Julie would lead the group. I empathized with Louis XVI who experienced another form of head-clipping.